Travelling abroad it is no longer a surprise discover a traditional Irish pub or to meet 'foreigners' with traditional Gaelic or Ulster Scots surnames. Nowhere is this more evident than in the former colonies of America, Canada and Australia. 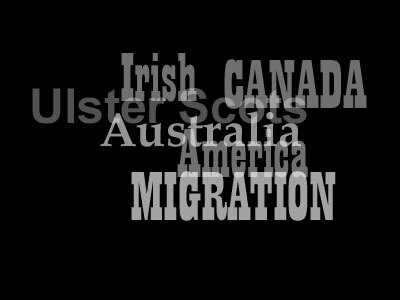 The large Irish community in America and the sustained Ulster Scots connection with Canada gives some indication as to the extent of the exodus from rural Ireland. In the generations since their settlement, the Ulster Scots and Irish settlers have made their mark on the various countries, even providing a number of United States Presidents. It is certainly true that family connections were a sustaining factor in the number of migrants seeking a better life. It was not uncommon for migrants to write home and even send money for their parents, brothers or sisters to make the same passage. They boasted of the attractions and of the level of employment and standard of living in these lands. In many instances, these letters were published in the local newspapers, attracting community members to leave for a new life. It was not uncommon, therefore, to have the same neighbours in Ireland as in America or Canada. The Public Record Office of Northern Ireland has amassed a large number of the passenger lists but the incomplete nature of the lists makes it difficult to number the migrants from this area. The modern pastime of tracing a family tree may stimulate a study into these records, providing better documentation and more accurate figures for the study of emigration. Some have been attracted to settle in Markethill and District from other countries. In the accompanying recording, Tatjana Nikolajeva talks about her native country, Latvia, and about working as a hairdresser in Hairconnextions, 75 Main St., Markethill. Use the audio controller to listen to this talk, given in 2014.